Originally virtual reality and augmented reality techniques were known for the excellent potential they showed in the video games and entertainment fields. Today however both VR and AR technologies are demonstrating their ability to transform the user experience in a wide variety of industries and service sectors. It is now clear that virtual reality and augmented reality are not restricted to the world of entertainment and gaming. They might have been closely associated with these ‘fun’ areas in the very beginning but now the figures show that their positive impact goes much further. A report from Goldman Sachs forecasts that by 2025 VR and AR will be generating more revenue than the television market. 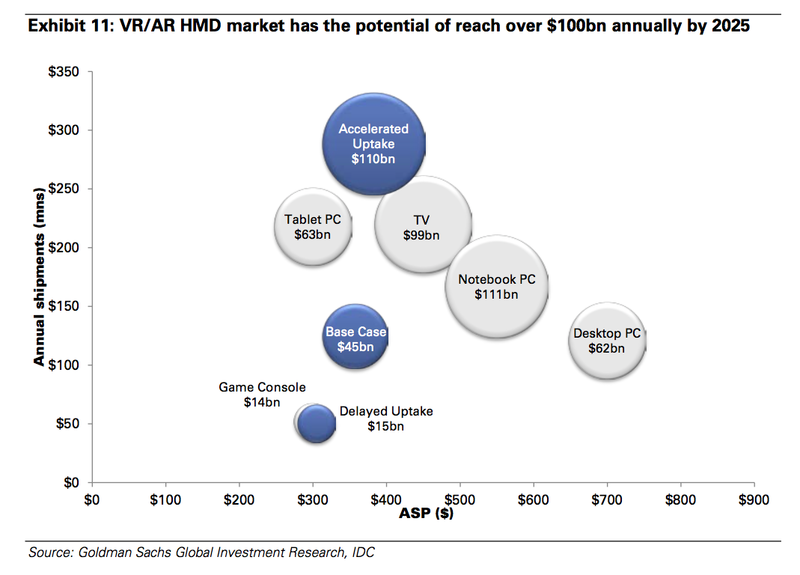 Meanwhile studies estimating the value of the VR and AR markets are outdoing each other in predicting revenue in the tens of billions. According to data and analytics provider CB Insights, back in 2015 startups working in this field signed off on 126 deals for a total of $658 million. Tech advisory firm Digi-Capital estimates that the value of the market will have topped $150 billion by 2020 and global market intelligence provider TrendForce forecasts that the market value of VR alone will hit $70 billion that year. The high tech giants got the ball rolling with substantial investments in the sector over the last couple of years. In 2014, Google injected $542 million into the secretive AR startup Magic Leap and Facebook acquired Oculus for $2 billion. Today the applications of these cutting-edge technologies have already pushed beyond the boundaries of the entertainment and gaming industries. “From the consumer’s viewpoint, AR and VR increase and enhance the human experience. Notions of time and space become relative. As a user, I can find myself in places that I’m exploring for the first time, in eras that I’ve never lived through. This can generate a lot of applications for a wide range of industries. This is even more true when VR and AR are combined with other technologies such as artificial intelligence and eye-tracking,” explains Sivan Iram, General Manager at River Studios, a company working in VR and AR which is part of the Rothenberg Ventures eco-system, the most active venture capitalist in the VR/AR space. Moreover, the power of VR and AR is being demonstrated in sectors such as commerce and mass retail, real estate, plus also in education and in-company training. A quick overview of the most innovative virtual reality applications currently in use should suffice to convince any doubters of the extent of AR/VR potential. According to Digi-Capital’s projections, VR- and AR-generated revenue will grow exponentially between now and 2020 (7-fold between 2017 and 2020). In the retail sector, a number of luxury and ready-to-wear apparel brands have ventured into filming their fashion shows in 3D, later relaying them to their shops, where customers can use VR headsets to get a virtual front-row seat at the show. Topshop did this using Oculus Rift equipment, while Tommy Hilfiger opted for the Samsung Gear VR in partnership with Dutch startup WeMakeVR. Rebecca Minkoff has even sold, in limited edition, branded Google Cardboard headsets for the modest sum of $24 so that the firm’s clientele could watch as if they were sitting in the front row at the brand’s catwalk show during New York Fashion Week early in 2015. On this occasion the New York luxury brand teamed up with Californian startup Jaunt. See article by Guillaume Degroisse, L’Atelier Marketing & Content Director, on virtual reality. Another sector where opportunities exist to greatly enrich the buying experience is the real estate business. Matterport, having raised $56 million from Rothenberg Ventures, Qualcomm Ventures and Y Combinator, offers to create 3D visualisations of for-sale properties for real estate agencies, a cut above the 2D photos and modest 360° panoramas that are still the norm here. Matterport provides a demonstration on a mobile app for the end-customer and will also provide the real estate agency with the hardware and software needed to make 3D visualisations, leaving the agency to take care of the actual shooting. Meanwhile GeoVC, a New York-based startup which is part of the Rothenberg Ventures portfolio (which has to date raised $710,000) has come up with an app that enables the user to scan a space, such as an apartment. It also allows you to measure the dimensions of a room and even modify the configuration – for example taking out one element such as a screen and replacing it with another feature. Here the immersive experience offered by VR technology is extremely useful when looking to purchase real estate. GeoVC reckons that people visiting a house or apartment with a view to purchase will tend to try and visualise themselves inhabiting the space and also project themselves forward in time – to the moment when any planned alterations have been completed. As the General Manager of River Studios emphasises, VR enriches the human experience. Taking this observation to heart, many startups have recently been getting into the education sector, which is an obvious field of application for these technologies. Plunge with London-based Alchemy VR into the midst of the primitive life forms which began to shape our world, listen to Albert Einstein explain his theory of relativity in an amphitheatre with the LectureVR created by Irish company Immersive VR Education, go on an expedition to Mars one afternoon with Google Expeditions, or simply practice your Spanish at a meetup via your headset, courtesy of Californian company AltspaceVR. Virtual reality has the power to transform the way we teach and how students of all ages acquire knowledge. zSpace technology is already in use in many educational establishments in the United States, revolutionising the way children learn about anatomy and biology. And it is just one step from education to the world of work. Virtual reality and augmented reality are now playing an essential role in the changes taking place in the workplace environment and the tools used by Human Resources departments. ScioVR gives us a taste of what professional training might look like in future. The Swedish startup has embarked on a research project – the ‘Virtual Operating Room’ – in partnership with Södersjukhuset, one of the main hospitals in Stockholm. Using VR headsets, the medical teams are immersed in classical situations, learn to repeat medical procedures over and over again, and also acquire best practice in terms of communication in the operating theatre. VR and AR technologies can thus enable all kinds of people to develop not only technical competence but also soft skills by immersing them in standard situations. Along similar lines but more in the realm of psychology and well-being, the Virtual Reality Medical Center in San Diego helps patients to manage their phobias by confronting them with the things they fear. Spanish startup Psious, which also enjoys the backing of Rothenberg Ventures, works in much the same way. Companies can use this approach to enhance their seminars and training sessions. Will company adoption of VR and AR encourage more widespread use of the technologies beyond the realm of video-gaming and take them to the general public? Technological progress – starting with ever-higher picture resolution – coupled with a progressive reduction in costs, could well be a driver. Pre-orders of Oculus Rift to private individuals, which opened in January, were sold out within a few hours. And guess which company is currently working on a VR headset? No less a player than Google, which is now researching a successor to its Cardboard. This is a sign of things to come that should not be ignored. AgTech creating new business opportunities?